Analog Motion, Virtual subtractive synth from UVI. 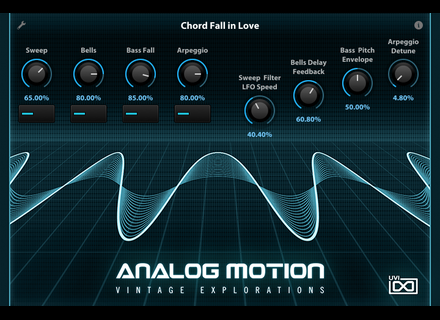 UVI has released Analog Motion, an expansion set for Falcon which features 111 presets inspired by the golden age of analog synthesis. UVI announces Analog Motion, the first expansion pack for their flagship hybrid instrument Falcon. 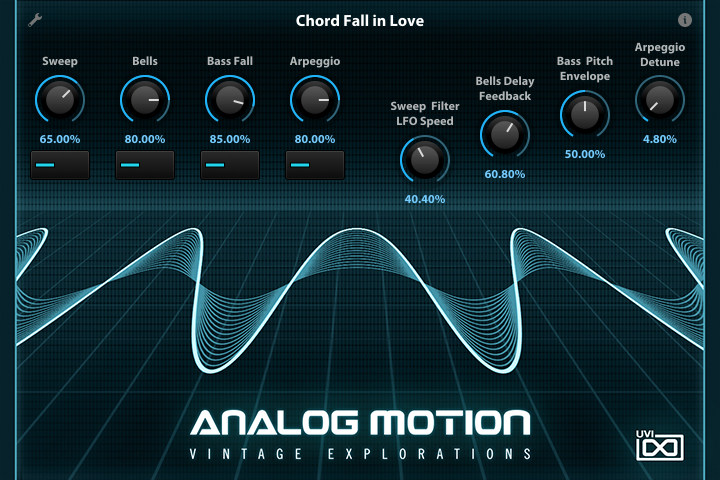 Analog Motion was designed to deliver electronic tones evocative of the golden age of analog synthesis, aimed at those looking to expand their library of ready-to-play analog-inspired patches as well as those looking for inspirational starting points for their own sound design using Falcon’s own semi-modular environment. According to UVI, Analog Motion was inspired by the vanguards of synth-driven pop music and classic genre film scores of the ‘80s, such as John Carpenter, Vangelis, Giorgio Moroder, Tangerine Dream and Thomas Dolby. Drawing from these influences, Analog Motion claims to provide Falcon users with a wide variety of warm, thematic and modulating sounds, including single-key soundscapes, arpeggiated sequences, traditional polyphonic synth sounds, rhythmic textures and more. Analog Motion takes advantage of the synthesis capabilities and software architecture of Falcon, which sports 15 oscillators, over 80 effects and a fast and intuitive interface that can handle both basic tasks and deep instrument design. All presets have been programmed with macros to provide the user with easy access to the key parameters of each patch. These may be controlled via MIDI, OSC, host automation and Lua scripting. Analog Motion requires UVI Falcon. It supports simultaneous authorization on up to 3 computers or iLok keys. Analog Motion is available now for $39 from authorized dealers and at the UVI online shop. Additional information is available at UVI's website. Studio One 3.2 now available As announced, Presonus has released update 3.2 of their DAW Studio One, with several new features.